Pre-heat oven to 425 °F (210 °C). Heat oil in skillet over medium high heat. Add onion and cook, stirring frequently and until soft. Add garlic and cook for 1 minute, add tomatoes and bring to a boil. Reduce heat to medium-low and let sauce simmer for 5 minutes, until tomato juice thickens. Remove skillet from burner and stir in parsley, shrimp and dill, and season with salt and pepper. Sprinkle feta cheese over the top. Place skillet in oven and bake until shrimp are cooked through and cheese has melted, about 12 minutes. 217 members have added this recipe to their cookbook. This was very easy, and I really like the feta and shrimp together. I didn't love the dill (will probably try thyme next time) and I'm pretty sure I should have drained the tomatoes because this turned out pretty soupy. Good enough to try again, though! This is such a great and tasty dish! Very light. I serve with whole grain rice and can even use reduced fat feta. Healthy low fat shrimp salad. 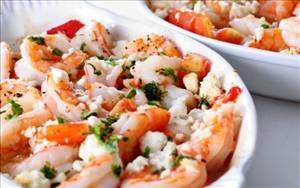 There are 284 calories in 1 serving of Baked Shrimp and Feta Cheese. Calorie break-down: 27% fat, 19% carbs, 53% protein.